Outward Bound trips encourage healing and help rebuild confidence. Outward Bound for Veterans, a non-profit program that aids returning service members and recent veterans through challenging wilderness trips, received a significant boost recently with a $1.2 million donation from Holiday Retirement (http://www.holidaytouch.com), the industry leader with more than 300 independent senior living communities. The donation funds an entire trip – including flights, food, lodging, supplies and instructors – for 600 military veterans of Iraq and Afghanistan wars. Originally developed for Vietnam War veterans, Outward Bound trips encourage healing and rebuild confidence for veterans struggling to readjust to civilian life. Participants are given the opportunity to escape daily routines and share unforgettable experiences with other veterans in some of the country’s most stunning locations. Home to approximately 12,000 veterans and spouses, Holiday Retirement’s communities collected donations during a three-month fundraising effort. Holiday Retirement then matched every dollar donated. William Reis, 25, was one of the veterans who participated in a Holiday Retirement-sponsored trip. He served one year as an army machine gunner in Baghdad, Iraq. While his family and girlfriend celebrated his return, Reis struggled to find peace. He is certainly not alone. Hardened by the realities of war, thousands of returning service members face mental illness, drug and alcohol abuse, failed personal relationships and unemployment. 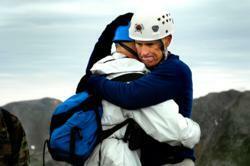 Outward Bound provides an outlet to help veterans successfully reacclimate. Reis’ Outward Bound trip included eight days of dog sledding through the Boundary Waters of Minnesota. Other adventures include backpacking, canoeing, mountaineering, rafting, rock climbing, and sailing. To learn more about the Outward Bound for Veterans program, visit http://www.outwardbound.org. To learn more about Holiday Retirement, please call 503-586-7289.